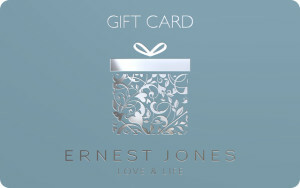 The perfect gift for that special someone, the Ernest Jones eGift Card can be used in any UK store or online at ernestjones.co.uk. Please present your unique eGift Card number prior to purchase at the till point. Please use additional payment methods for any outstanding balances on purchase. Visit www.ernestjones.co.uk for online purchases and enter your eGift Card number and Pin on the Payment Details page at the Checkout. Please use additional payment methods for any outstanding balances on purchase.